APCO Worldwide’s New Website – Is It Better Than A Billboard? After our coverage of APCO Worldwide’s CEO Margery Kraus last week, I received a very nice invitation from APCO’s Online Marketing Manager Elsa Faust, thanking us for the coverage an inviting me to review their redesigned corporate Website. 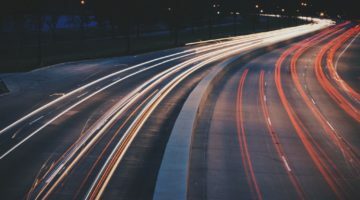 Everything has previously done a series of evaluations for websites of the largest PR firms in the US, of which APCO’s site was one of the first. So, we thought we would take a look at the new “digital face” of one of the world’s most powerful PR firms. The newly launched APCO Worldwide website is aesthetically much more pleasing than the previous version. However, and I say this with a fully objective mindset, it still remains a simple circular data base of information about the company and its services. Aside a couple of interesting changes and the addition of a great number of commentaries and white papers (at least I believe they are new), the site represents a “one way” communicative device. I applaud the designer of the site for the upscale and professional look of the site, but this says little about navigation, and what one might term “cutting edge” innovation. 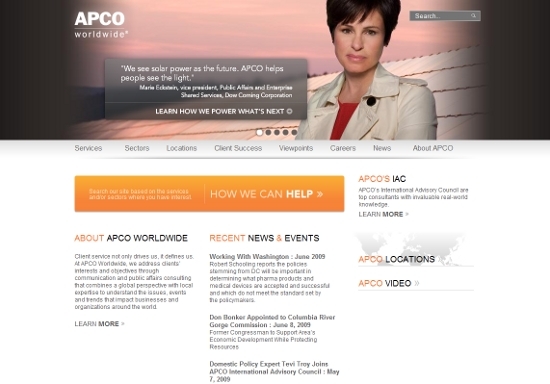 APCO Worldwide Website landing page. I actually hate being negative about these sites, and this is especially true for APCO’s, but with the resources available to this company, one simply must expect more from their online presence. I do really like some of the additions to the site, such as the “How We Can Help” interface, which leads potential clients through a more refined and narrowed search process to see APCO’s services. After the beautiful aesthetics, the new interface for search, and the potential of Virtual Vantage Points (I will discuss this briefly later on), my love affair pretty much ended on digging deeper into the new site. PDF’s listed in a linear fashion, as are all other news, tips, commentaries and the like, is not exactly a user friendly way to present what should be the heart and soul of APCO’s site – the knowledge of these extraordinary people. The same pretty much goes for every aspect of the site in that corporate jargon, mixed with testimonials and a few faces, does not make a “new age” (or even improved) online presence. However, for most business people APCO’s site still does reflect the essence I got from the original site: “We are about business and if you need us call.” APCO’s new site is just that too, all business. The problem for APCO, like for so many others, is that business these days (and in the days to come) is not business as usual. There is a “conversation” going on, and though APCO acknowledges this, there is no evidence other than some executives with social media titles, that anyone is doing more than lecturing. I mentioned an aspect APCO came out with called Virtual Vantage Points, which is more or less a blog. The premise of this element is very, very good, though the actual practice of “blogging” seems nowhere apparent. What I mean by this is, VVP is intended to engage experts in the industry to join the conversation, a great idea. But, comments are closed, the posts are all too far on the academic and dry, and like most other corporate sites – it seems a half hearted effort to join the digital revolution. As for Studio APCO, a similarly vague attempt at digitalizing a Web 1.0 website, that aspect is non-extent on the new one. As for video or podcasts, well, adding a huge button on the landing page for video, and then putting one “powerplay about” video under it, is not what I would call “reaching for the social web stars”, so to speak. The reader (and everyone at APCO WorldWide) must be thinking; “What does this guy want from us?” well, here is the rub for me. So everyone understands, APCO was founded by one of the most successful and dynamic voices in Washington, their client list is like a “Who’s Who” of leading “movers and shakers”, and the company obviously has fairly massive resources. To interject a sort of “makeup job” atop some text and a few images of people is not worthy of Margery Kraus or her company. This is not only true for APCO, but for just about every major PR firm on the planet. In the years to come, or even now for that matter, companies in need of these experts should be able to not only glean basic information about the company, but they should be able to directly interact with whatever arm of this giant of PR they need to. Access to some emails (which I should note seldom get answered by APCO or any other large PR firm), and some Twitter updates, is decidedly NOT what I expect from the best. Clearly APCO, Margery Kraus, and her team are among the best, and so I guess they need to reach out and find ways in which what I suggest can be accomplished. Virtually a blog is still not a true blog. As a final note, this nice lady, Elsa Faust, reached out to me and asked for any suggestions in the message I alluded to earlier. For my part, I replied in email that I would attempt to do so before writing anything overly condemning, out of professional courtesy. I just want to be transparent here. I expected to find a highly refined website, with many of the aspects we covered before taken into account. So it is, that in order to be totally objective in this report, and in the end to help APCO and others modify their thinking, this article needed to be “shot from the hip” so to speak. I could have opted to not review the site at all, but if ACPO and other firms can take some of this to heart, really engage in conversations, and rather than advertising “listen” to people via their online conduit, then a lot more can be accomplished. As for suggestions, though I am quite expert at evaluating UI’s, navigation and anything “social” about websites, I suggest APCO allow us to recommend the proper people to make this website shine. As it is the online APCO Worldwide brand could as easily be a billboard on I66. It does always amaze me too that companies with millions, and especially those in PR, cannot seem to put up a state-of-the-art site. The news one you outline appears to be something on the budget end of things to me. Are they really serious about online PR?